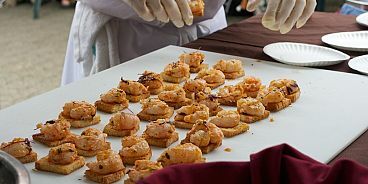 The Chefs’ Table Society of British Columbia is proud to kick off one of Metro Vancouver’s most beloved food festivals: the 8th Annual Spot Prawn Festival. Each year at this event, Chefs’ Table Society member chefs from across the Lower Mainland serve you fresh-from-the-boat spot prawns, as they aim to educate diners about this local, sustainable and delicious delicacy. Festival day is Saturday, May 10, 2014 at False Creek Fisherman’s Wharf. Presented by Pacific Prawn Fishermen’s Association and the Chefs’ Table Society of BC, the festival gives attendees the opportunity to enjoy free entertainment, free activities for kids, and attend free cooking demonstrations from top local chefs on the culinary stage, emceed by Chefs’ Table Society member, Ned Bell of YEW at the Four Seasons Hotel Vancouver, all while taking advantage of the chance to buy live, locally-sourced prawns directly from the dock. Get your tickets for the region’s biggest Spot Prawn Boil today. The festival was so popular last year that tickets sold out well before festival day, so you are encouraged to get your Boil tickets early and guarantee your spot [prawns]. The Spot Prawn Boil Single Admission ($15) includes a plate of three succulent BC spot prawns plus a selection of sauces, salad, and baked goods, and access to the drink tent for free samples from coffee, beer, and wine sponsors. Or the Brine and Dine Combo ($40) makes a special day out. Treat your favourite person to lunch on the wharf and pack some spot prawns to take home. This combo includes two Spot Prawn Boil single admissions, and one Chefs’ Table Society insulated tote bag, so you can take your live spot prawns home in style. When the festival day is over, you can still get your fill of spot prawns throughout the harvest season. Check weekly at www.spotprawnfestival.com for more events, and where you can dine on this succulent sea bounty. The Spot Prawn Festival would not be possible without the generous support of its sponsors and the Chefs’ Table Society of British Columbia thanks the Pacific Prawn Fishermen’s Association, False Creek Fisherman’s Wharf, Organic Ocean Seafood, and media partners Vancouver Magazine, and Scout magazine. BC spot prawns are very popular in Japan and the rest of Asia, with more than 90% of BC’s commercial catch consumed there. Most of the prawns are frozen at sea by fishermen, and then packed and exported across the Pacific. The remaining few, however, are available to be enjoyed fresh in local BC restaurants and kitchens during the fishing season! Frozen spot prawns are also available in Canada year round.